This flourless brownie recipe is a longggg time coming. So many brownies have happened over the last couple of years, using various grain-free flours and nut butters as the base just didn’t give me the results I was wanting. Success came when I based the recipe off of an old BRG favorite: the Chewy Brownie Crinkle Cookies. 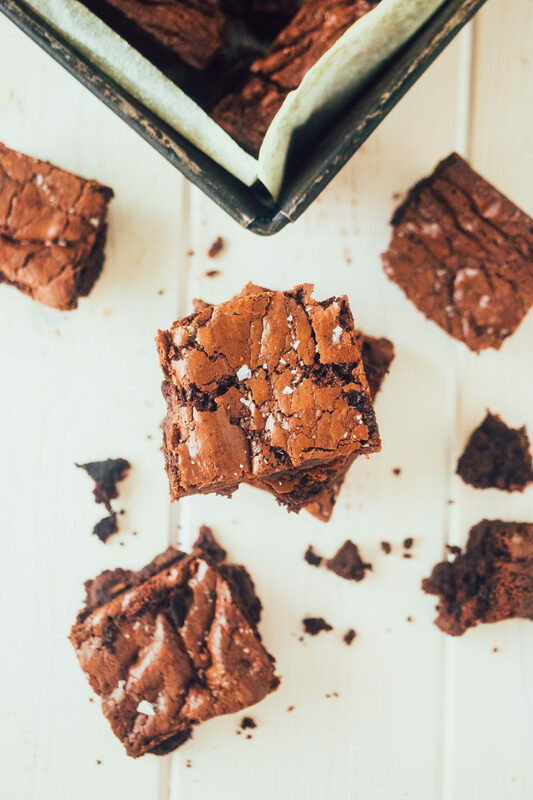 The two recipes are nearly identical but the brownies have a much-needed higher amount of fat, which is what gives them the super moist texture I’m so fond of. They freeze well AND they also keep on the counter well for dayyssss while still remaining moist. I recommend freezing to possibly, maybe, slightly deter you from eating them for every single meal 🙂 Someone please come over and help eat all the extras I have frozen. Preheat the oven to 350F. Line an 8×8 or 9×9 baking pan with parchment and lightly grease the parchment. While the eggs are beating, melt 4 oz. of the chocolate chips (about 3/4 cup) with the butter and vanilla extract in a double boiler (or microwave at 30 second intervals, stirring in between until smooth). With the mixer on low speed, slowly pour the melted chocolate into the whipped eggs. Increase the speed to medium and mix to combine. In a separate bowl, whisk the cacao powder, arrowroot starch, espresso powder, baking soda, sea salt, and the rest of the chocolate chips. Pour the dry ingredients into the wet and mix on medium speed until just combined (it will resemble thick brownie batter). Pour the batter into the lined baking pan. Bake for 25-30 minutes, or until the center is no longer jiggly. Rest on the counter for at least 15 minutes before serving. Sucanat will give you crispier tops than coconut sugar but the resulting taste is the same for both. A granulated sugar is necessary for the crisp, yet chewy, texture. You need 4 oz. of solid chocolate for these brownies to bake up properly. Anything above and beyond that is for stirring in for that extra melty chocolate goodness. These are fairly sweet when using dark chocolate (you could use milk chocolate but then they’d be VERY sweet). Sub out 100% chocolate for a richer, less sweet brownie.